It is all in the blood. His father was nicknamed El Matador - and Carlos Sainz also demonstrated extraordinary bravery and commitment to climb off his hospital bed after a horrifying crash in practice to produce a superb drive in the Russian Grand Prix. It was cruel luck that, having risen from last on the grid at the start to seventh place and potentially his best result in Formula 1, the brakes on his Toro Rosso failed with eight laps to go. Even then, the 21-year-old Spaniard refused to accept his gutsy comeback was over, twice returning to the track with a car that he was no longer able to slow down, before finally accepting defeat when part of his rear wing fell off. There may not have been any tangible reward for his efforts, but Sainz's magnificent tenacity suggests he has a big future in the sport. A hush descended at the Sochi circuit when the TV cameras showed a Toro Rosso buried underneath the barriers at Turn 13 in practice on Saturday morning. Inside the car was Sainz but he could not be seen and there was no communication from the driver over team radio. He had smashed into the outside concrete barrier as he braked through the kink before Turn 13 and the car scraped along the wall, leaving a series of tyre marks, before spearing straight across the run-off area and into the barriers at 93mph with an impact recorded at 46G. Ferrari's Sebastian Vettel said: "It was shocking to see that he was so deep in the barriers and that he was covered by barriers." It had been a head-on impact and debris littered the track. There were serious fears for his well-being but, as he was strapped on to a stretcher and carried to an ambulance, a reassuring thumbs-up demonstrated he was conscious. However, that would be the last we would see of him for the weekend. Wouldn't it? After Sainz's manager tweeted that he was doing "perfectly" in hospital, the driver himself posted a message on Saturday afternoon, boldly stating: "All OK! Nothing to worry about! Already thinking how to convince the doctors to be on the grid for tomorrow!" He left hospital on Saturday evening and, after being examined by the FIA medical delegate and chief medical officer on Sunday morning, he was cleared to race, surprising many. 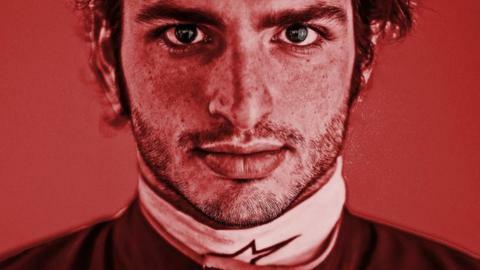 Perhaps we shouldn't be surprised by Sainz's spirit and skill, given his pedigree. His father, also called Carlos Sainz, is acknowledged as one of the greatest rally drivers of all time, winning 26 races and being crowned world champion in 1990 and 1992. He was cruelly denied a third title when his Toyota Corolla's engine failed approximately 400 metres from the end of the season-ending 1998 RAC Rally. Sainz senior became the first non-Scandinavian to win the 1000 Lakes Rally in Finland and did so with a broken ankle, having crashed during a night-time practice run. No wonder he was known as El Matador. And junior also appears to be made of stern stuff. The 21-year-old's Twitter profile states "if in doubt, flat out" and that was certainly his approach in Sochi. Because of his crash, which followed two practice sessions on Friday largely ruined by a diesel spill and heavy rain, Sainz had only completed 15 laps in the dry before the lights went out on Sunday. No matter. By lap six, he was 13th after overtaking fellow Spaniard Fernando Alonso and he continued to make his way through the field until he was lying seventh in the closing stages. Sainz was managing brake issues after being told the temperatures were very high but sadly they caught up with him less than eight laps from home as he spun off and rejoined the track, only to be pitched into the same Turn 13 barrier he crashed into on Saturday. After everything he had been through, Sainz was loath to accept defeat and drove back on to the track, but part of the rear end plate fell off his stricken car and he was forced to park it. There were mixed emotions for Sainz afterwards, as he tweeted: "At the end I decided to race... and what a race. From last to seventh with brake problems. Eventually I had to retire... best race of the year." Speaking to Autosport magazine, he also admitted to feeling "dizzy" during the first 10 laps before "it went away and I could push normally, no problems at all". Sainz is coming towards the end of his first season in F1 and has made a good impression, although he has often been overshadowed by the exceptional performances of Toro Rosso team-mate Max Verstappen, who has only just turned 18. However, it is worth noting that he is the leading Spaniard in this year's drivers' championship, with his current total of 12 points being one better than two-time world champion Alonso. With Toro Rosso's future in doubt as owners Red Bull attempt to solve an engine supply crisis, we can only hope that Sainz's racer's heart will get the blood pumping again in 2016.